The game Need For Extreme presents a breathtaking variety of arcade races. You drive a racing car and your task is to finish first. Thirst for speed and danger makes the game more captivating. You are to take a new route full of obstacles in a limited period of time at each level. 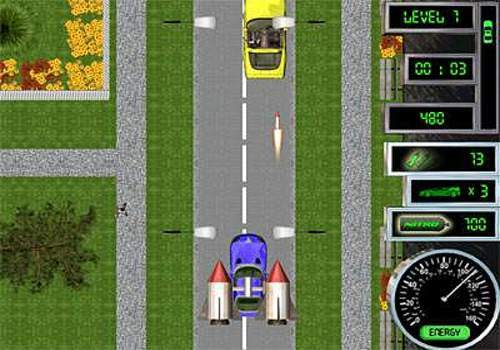 The obstacles reduce the speed, skid your car or cause a car crash. The opponents' cars will stand in your way. The speed of your car reduces if you take an earth road. You can pick up such bonuses as life, scores, speed, and a gun. Join your counterparts from all over the world and beat your best score! If your score is among the Top 10, you can upload it to our Web site and thousands of other players all over the world will be able to see your highscore! Are you up for the challenge? Download Need For Extreme and Play for Free! Conduisez une moissonneuse-batteuse, dans les rues de la ville des temps anciens, et écrasez les voitures qui sont sur votre chemin.